Summary: Up at her Gran’s place on Rain Lake, Manitoba for the summer with her warring family, Lizzie seeks solace on an abandoned island with plenty of secrets. 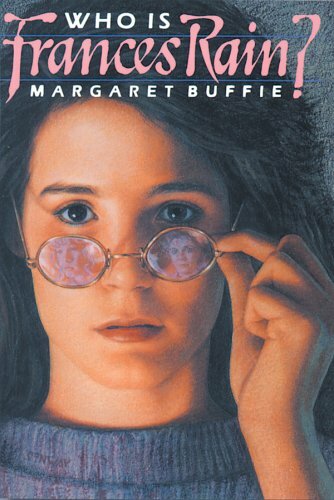 When Lizzie’s excavation of the remnants of a cabin turn up a pair of spectacles, Lizzie dons them only to be transported to another time when the island wasn’t abandoned. Witness to the life of Frances Rain and her mysterious visitor, Lizzie slowly pieces together who Frances Rain was and what happened to her. In real life, Lizzie is dealing with the potential break up of her new and fragile family and learns her beloved Gran is keeping secrets of her own. Somehow Lizzie must find a way to mend the brokenness in her family and help her Gran find some peace. Review: While I loved the concept of travelling back in time with a magical pair of spectacles, I think it fell apart a bit in its execution. Margaret Buffie provides her reader with a real family struggling to deal with the unexplained abandonment by their father. Evan, Lizzie and Erica’s mother remarries a man named Tim who seems to be everything their father isn’t, but Evan and Lizzie take out their anger toward their father on Tim, refusing to let him into their lives. A summer with their Gran changes everything though as Lizzie in particular learns the meaning of family and begins to see things from different perspectives. Her time-travelling experiences show her the tragedy of miscommunication and inspires her to apply what she has learned in her own life with positive results. Even after finishing the book, I still have questions about who Frances Rain actually is. I know what she did for a living, and that she had a daughter, but I’m not sure why she didn’t speak much and why her father was such a jerk. Also, who was Teresa’s father? As for Lizzie’s family, I have questions there too. If their father decides to leave them and only contacts his kids on their birthdays, why would he start calling up their mother again? Simply because she found someone else? Buffie does do a thoughtful job of portraying a family who is grieving, as well as the very real pull Connie has to her ex-husband even though she knows Tim is better for her. Who Is Frances Rain? exemplifies how challenging it is to learn to trust again after being wounded. My favourite character was Gran because of her no nonsense attitude and her ability to cut things to the quick. She may have been at odds with her daughter Connie at times, but she always loved her. Fiercely independent to a fault, she models strength and love to her granddaughter Lizzie when she needs it most, helping her to open up to the good Tim brings to all of their lives and naming the truth of Lizzie’s father’s actions. I liked the happy ending and the fact that Lizzie was able to give Frances Rain some peace, as well as the resolution of the mystery, but I think it’s a lighter read geared toward pre and early teens. Who Is Frances Rain? by Margaret Buffie is published by Kids Can Press, (1987).